Harnessing the Power of Human Stem Cells as an Adjuvant to Microneedling as we age, there is a natural decrease in the levels of growth factors and cytokines that maintain the youthful appearance of our skin. Many of these factors are abundantly produced by our stem cells, which also decrease in number as we age. Now FactorFive, backed by real science, is harnessing the power of human stem cells. FactorFive helps your skin by providing human stem cell derived factors to boost and replace those that typically diminish with age. By providing the missing factors, the skin cells begin to behave more like they did when they are younger including an increase in collagen, elastin and extra cellular metric proteins that support skin firmness. 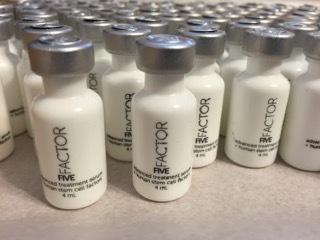 FactorFive is a blend of regenerative cytokines (tissue healing factors), polypeptide complexes, and potent human growth factors that work to fight the 5 signs of aging and promote youthful skin. product. There are no individual compatibility issues with these proteins.